When it comes to Earth Day, I am something of a cynic. As a blogger, the press releases and marketing emails flood my inbox as everyone under the sun tries to look green on this one day in April. I usually won’t play, but an offer from Marie Veronique Organics caught my eye for two reasons: 1)My experience with MVO products 2)MVO’s donation to Center for Environmental Health (CEH). 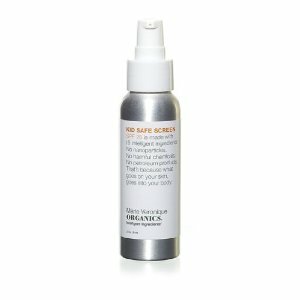 The combination of quality organic skincare products with one of the best non-profits protecting our children’s health caused me to jump on board the Earth Day bandwagon today. We are giving away MVO’s Kid Safe Screen, SPF 25+ in celebration of MVO’s commitment to donate 25% of all sales today to CEH. It’s all part of our never-ending commitment to sustain your skin…and the planet with natural, organic and fair trade ingredients, packaged with 100% recyclable materials. To enter, leave a comment to this post describing some outdoor adventure you plan to do with your children in which MVO’s Kid Safe Screen, SPF 25+ will come in handy. Contest closes April 29, 2010 at midnight (PST). The winner will be selected randomly from the comments. The winner will be contacted via email for shipping instructions. No harmful chemicals, nanoparticles, parabens, petroleum products, fillers, waxes or fragrances. Good luck and happy Earth Day! My 2 1/2 year old is learning how to ride a bike. We’ll be out in the sun a lot this summer!! We will be going to the beach, playing at the park and lots of other outdoor activities – I have a 4 yr old, being outside is a must!! We’ll be heading to the beach for some fun in the sun (and water)! The sunscreen will be great. Thanks for the giveaway! We are planning our annual one week beach vacation! We will spend long hours in the sun and always use the MOST natural organic sunscreens. We also live in a place where we have extremely long winters. Right now at this altitude when the sun comes out so does the sunscreen! Thanks we look forward to trying even if we are not the lucky winners!!!!! My husband and our 2 boys spend 2 weeks of vacation each summer in Sweden at our family’s houses. We’re in the beautiful green forest, and a nice walk to lake. The boys have the freedom to roam and play in the grass with Opa’s model trains, pick wild blueberries, and wade in the (sometimes chilly) water. It warm, not hot, but the sun is shining and we “slather up” every morning! Planning a BBQ/pool party with a bunch of friends and their kids. We will be eating and playing in the water. We live in South Carolina and our daughter spends a lot of time outside in the sandbox, at festivals, going on walks, etc. all year round! We took her to the beach for the first time a few weeks ago, and she is hooked! We would love to get to try this safe sunscreen this spring and summer. I am debating to buy this product or not. I would love to try it first! To our suprise we have a curly, red headed little man with fair skin so protection is turning into a daily routine for our family. For our next adventure we are taking our 1 and a 1/2 year old on his first train ride. I can’t wait. Followed by an Easter egg hunt in the park. Just another outdoor and fun filled day for our little man. We have a beautiful nature preserve here with a beach. All on a little island. I hope to spend hours and hours there this summer with my kids playing in the sand and watching the eagles, sea lions, osprey, deer and other local critters. I don’t know how much of an “adventure” I’ll have with a 6 month old, but we are going to Hilton Head!! We will be going to the pool a bunch this summer! It’s the only thing we can do outside during our scorching Texas summer heat! After a long, cold Maine winter my children are looking forward to shedding their winter gear and letting the sun rays wash over their bodies. We enjoy playing in the sand and surf of the beautiful Maine coast and swimming in the lakes and rivers close to home. Hiking, biking and picnicking will also be enjoyed with total abandon. I will definitely need some MVO sunscreen when I take my 10 month old out to enjoy the grass, and “help me” in the garden this summer. We are going camping (in June and August) at Assateague Island National Seashore in Maryland. There are wild ponies and lots of open beach to explore! Applying sunscreen is a must since the only shade will be provided by beach umbrellas and a tent.